​Radiographs (x-rays) allow our doctors to better diagnose injuries, illness, and other medical conditions in your pet. Our on-site digital radiology suite means we can provide high quality x-rays with same day results! 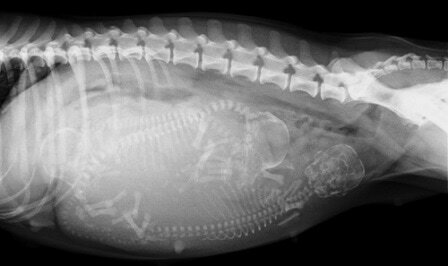 This x-ray shows a pregnant dog with puppies three days before the puppies were born. ​To better enable our doctors to accurately diagnose and treat your pet, we also offer ultrasound technology. An ultrasound machine utilizes sound waves to help the doctors visualize internal organs and blood flow. While an X-ray gives us a shadow outline of the organs, ultrasound allows us to see inside the organs to look for abnormalities. This greatly increases our ability to assess your pet's health and to diagnose your pet's condition.